In this picture, three different filters (r' i' and z') have been combined to show how red the quasar (indicated by the arrow) is compared to stars or galaxies in the field. 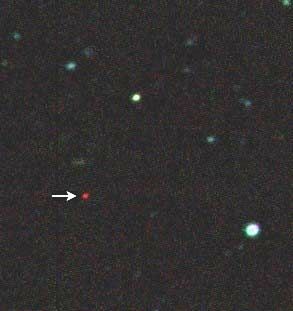 To be that red is a good indicator that the object is a very distant quasar. The mostdistant black hole ever found is nearly 13 billion light-years from Earth,astronomers announced today. TheCanada-France-Hawaii Telescope spotted the bright burst of light the black hole created asit sucked up nearby gas, heating it and causing it to glow very brightly inwhat's known as a quasar. Thedistance to the quasar, which sits in the constellation Pisces, was determinedby measuring the amount of redshift in the lines of the quasar?s spectrum, orprism of light. Because light is ?redshifted? to longer wavelengths as anobject moves away from an observer, the higher the redshift, the further awaythe object is?and this quasar had quite a large redshift. ?As soon asI saw the spectrum with its booming emission line, I knew this one was a longway away,? said team member Chris Willott of the University of Ottawa. Because theBigBang is believed to have occurred around 13.7 billion years ago,astronomers are seeing the quasar as it appeared a mere 1 billion years afterthe Big Bang, which gives them a unique view into universe?s past. Sometimearound the universe?s one billionth birthday, the first stars and galaxiesbegan to shine and ionized all of the hydrogen atoms in the universe (orremoved an electron from each atom). The quasar?s bright lightilluminates the hydrogen gas in front of it, which lets astronomers see whetherthe atoms still have their electrons attached or not, which could help pin downthe date of this momentous event. The quasarmight also be able to help astronomers learn about the growth of the firstblack holes; the black hole powering this quasar is estimated to be about 500million times the mass of the sun, which is thought to be unusual for an earlyblack hole. ?It ispuzzling how such enormous black holes are found so early on in the universe ? becausewe believe that black holes take a long time to grow,? said team member JohnHutchings of the Herzberg Institute of Astrophysics. The findingwas announced at the annual conference of the Canadian Astronomical Society.